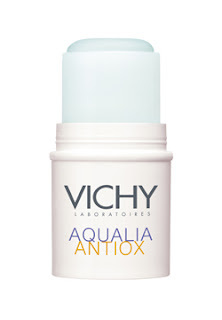 Beauty Necessity: Vichy Aqualia Antiox Skincare | Fashion. Style. Beauty. | Life is short. Live well. One of the things that you’ll notice about a lot of us bloggers is that we’re constantly into our skin. When you’re out five nights a week covering events, it can take a huge toll on your face. Finger foods, cocktails, multiple product samples and late nights are just the beginning of the issue. Add to that the pollution of the city and other environmental factors and it has most of us holed up indoors on weekends slathering on products attempting to apologize to our tired, weary skin. I recently received the best way to say I’m sorry to my face: Vichy Laboratories Aqualia Antiox Skincare. A new offering from the French skincare company, this is skincare that works over time to correct skincare damage, rehydrate and refresh tired and mistreated skin. 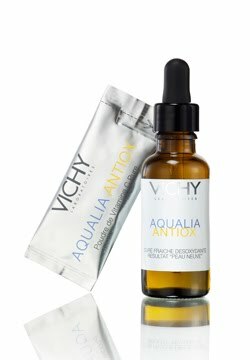 The Aqualia Antiox “New Skin” Result Deoxidizing Fresh Treatment ($45) is a bottle of sheer magic. Used for 21 days as part of your current routine, it contains two powerful, highly-concentrated portions of pure Citrus Polyphenol™ (in a liquid serum) and pure 10% Vitamin C (as a powder sachet), antioxidants that when mixed become an incredibly effective serum that creates a youthful rosy complexion, even and healthy skin tone, and an enviably smooth texture. I’ve been using the product for the requested 21 days and honestly, this product delivers like Domino’s. Not only is my skin completely hydrated and smooth, but it actually feels like it makes my normal skincare routine more effective. I’ve been layering the serum on under my night cream before I go to sleep and I wake up to grateful skin. Considering that I put my face through its paces regularly, that’s saying something. The other item that is a must-have from this fabulous skincare line is the Anti-Fatigue Ice-Effect Stick ($28). For those of us who suffer from under eye circles and/or bags under our eyes , this is a handbag secret weapon. The stick has a cooling effect that soothes the skin under the eyes to relieve puffiness and diminish dark circles. Everyone from the cocktail set to busy moms on the go or even corporate desk jockeys can benefit from this little item of goodness. So when you see me walking around with a little special glow, now you’ll know. I’m glowing with love….for these fabulous Vichy products.